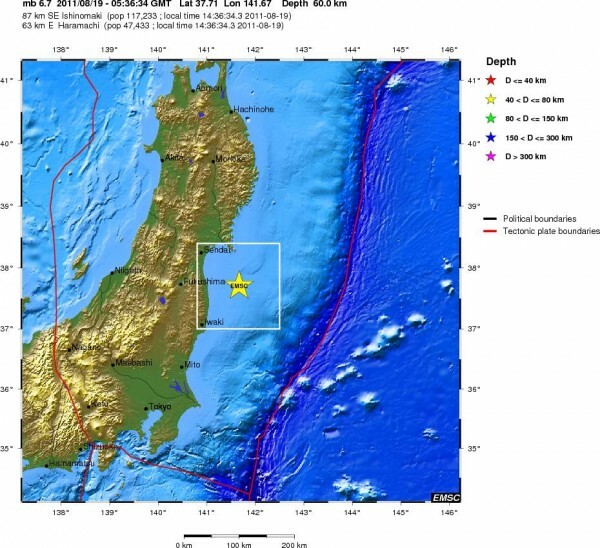 A strong earthquake meassured 6.8 magnitude struck near the east cost of Honshu island Japan at depth of 20km, according to Japan Meteorological Agency. 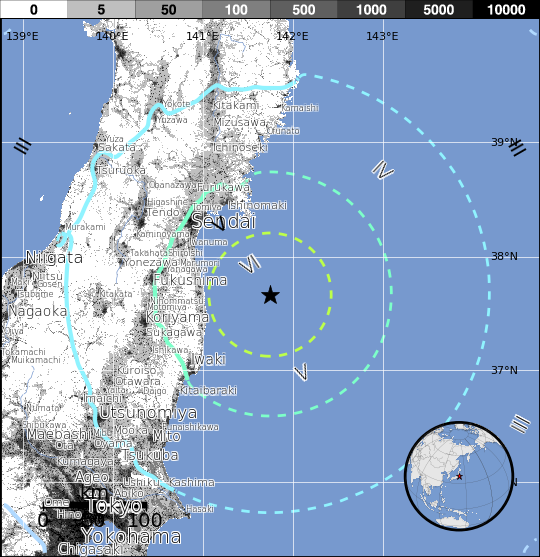 USGS meassured 6.5 magnitude with epicentre 99 km (61 miles) SE of Sendai, 103 km (64 miles) NE of Iwaki, 113 km (70 miles) E of Fukushima and 283 km (175 miles) NE of TOKYO, on depth of 39.1 km (24.3 miles). EMSC registered 6.3 magnitude earthquake. 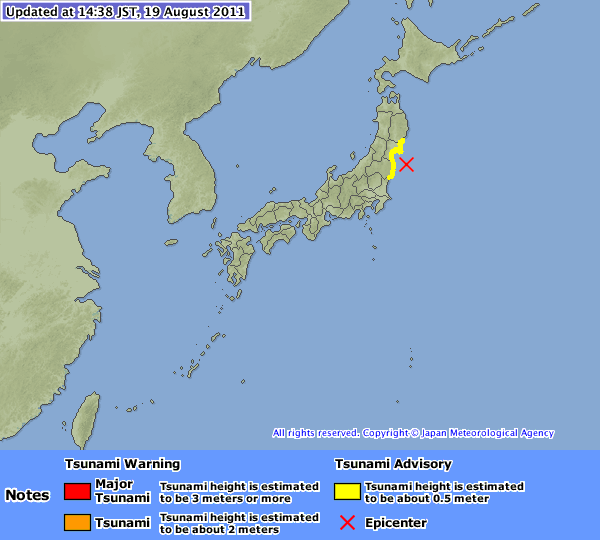 Tsunami Advisories have been issued by JMA for Miyagi and Fukushimaprefectures of Japan. Tsunami height is expected to be about 0.5 meters. Although there may be slight sea-level changes in coastal regions other than the above, no tsunami damage is expected in those coastal regions. Attention advised. An earthquake with a preliminary magnitude of 6.8 jolted northeastern Japan on Friday afternoon, but caused no abnormalities at the crisis-hit Fukushima Daiichi nuclear plant, the Japan Meteorological Agency and the plant operator Tokyo Electric Power Co. said. The agency issued a tsunami warning for the Pacific coast following the 2:36 p.m. quake, which measured lower 5 on the Japanese seismic intensity scale of 7 in Miyagi and Fukushima prefectures.